Last night Holly and I viewed Terence Malick’s The Tree of Life, having no preparation or knowledge about subject or style. One of those films you throw in the bag at the library so you have a variety to select from should the time offer itself. A kind of imaging of dialectics. Aside from the choice of personal pronouns relating to “ultimate questions” it has stayed with me. The oddities of learning development for the human organism; the broader context our lives happen within; contexts and networks, systems from family-to-universe, from cell-to-individual. The developments of guilt and shame. The nostalgia for innocence, the wonder of betterment, of choice. What experiences “stick” and become paradigms to fit new experiences within. The music was glorious and suited expertly to the images and tone. I guess I recommend it. It is a worthwhile experience to add to your complex and idiosyncratic mix. I found it a beautiful yet unsettling movie, certainly hard to forget. The music score was done by Alexandre Desplat, one of my favorite film composers. Perhaps I will revisit this film. 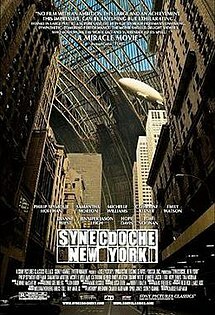 Oh, I loved Synechdoche, New York. I guess I should watch it again! An ambitious film. I really liked it.